Unless something significant has changed, your #1 auto attack will do a good chunk more damage than the fire breath skill, partly because how slow the fire breath does damage. Correct, even with a really big Condition Damage value, Fire/Dagger1 does more dps than Fire/Dagger2. The advantage to Fire Breath is that it's easy to give a bunch of foes Burning... which can lead to more damage than the auto-attack depending on your build. DD, for example, gives you FireDagger5 which does way more damage if the target is burning. There's also traits that proc on the foes being on fire. All that being said, if you do have a decent Condition Damage value, it's totally worth hitting Fire Breath whenever it's off cooldown.. it'll keep foes burning while you go back to auto-attack mode. This. The goal is burning everything so that I am doing passive damage to archers that run out of range or meleers that are having pathing issues. I use the #3 as an opener and then use #2 to get them all burning whatever they have left and then finish them off with the #1 which at close range is devastating since all 3 darts hit one target. #1 is also great against objects like weapon racks. I made some changes to my warrior build. I swapped 6x Ruby Orbs for Superior Rune of the Centaur, giving me better swiftness uptime and swiftness on heal which is useful for maintaining mobility. I regret the loss of 12% crit damage, but swiftness is important in WvW. I had seriously considered Vampirism runes, both the lifesteal and mist form, but apparently these still don't work well as implemented, plus the cooldown seemed not that great. I'm going to experiment with some different food buffs and see what suits. Lifesteal food still has a use, but Rare Veggie Pizza for +40% condition duration is appealing, especially with Longbow. Reading your thoughts on warrior with interest. My warrior made it to level 40 last night. Currently I'm using axe/mace and longbow and focusing on precision and crit damage. I think I bemoaned the lack of swiftness on the warrior earlier in this thread, but boy was I wrong! I'm currently running around maps with signet of rage and a banner in my hand and have nearly constant swiftness. Signet of Rage is great but I don't like using it for movement if I'm likely to end up entering combat with it on cooldown. Warhorn is decent, though, and with the Centaur runes I'm only without swiftness for a couple of seconds while using it. Having given it some more thought, I think I was right to stick go for berserker gear over rabid or carrion as the overall damage is going to be higher ... and generally I just feel the game rewards high crit chance/damage over condition damage most of the time (not knocking condition builds necessarily, preference comes into it too). However I am experimenting with Rare Veggie Pizza this for the +40% condition duration. And let's face it, you can carry a range of food buffs for different situations. Funnily enough I've seen a few longbow builds being posted in the GW2 Warrior forums over the last couple of days. I'm still enjoying it but switched from sword to axe on my secondary weapon set, as I just felt that being damage/lower survivability build it was better to have a strong but mobile burst for those situations someone feels like tackling me at close range. My warrior just hit level 80. I sprung for the tier 3 asura cultural armor immediately, but I'm still trying to get a handle of how to play it. Been using axe/mace and longbow. I keep thinking I should be using the rifle in a crit build, but it's too single target and doesn't seem to kill fast enough for me. Build is 10/25/0/20/10, with a focus of getting higher damage from built up adrenaline and keeping up crits. Any thoughts on how I could improve the build, or what else I could try. I really like the hammer, but sword/axe is also incredibly fun, especially if you spec for precision. The Asura cultural armor is Carrion stats (condition damage, power, vitality), and longbow gives you access to conditions (fire and bleed) so that seems like a decent fit. What are your trinkets, runes and weapon stats? You need to be getting precision and crit damage from somewhere. Berserker trinkets would give you that, or a combination of knight/cavalier stuff if you want toughness. If you don't have runes yet, 6x ruby orbs are a great (and inexpensive) option for increasing damage output. A lot depends on how you want to play and what you spend most time doing (PvE, PvP, WvW?). Axe/mace is a solid pairing, and but as Stengah mentioned, sword main hand adds mobility and applies bleeds. I prefer axe, but I don't run condition damage gear so YMMV. (1) Berserker's Power makes huge sense in a greatsword build, because Arcing Slice is so useless nobody uses it and so you can run around with +12% damage. Both longbow and axe have good burst skills, and in particular I tend to put out Combustive Shot whenever it's available. I guess it depends on how long you hold onto your adrenaline for. (2) Have another look at Stronger Bowstrings (Tactics IV). It increases range as advertised, but it also adds guaranteed projectile finishers. Very nice given that you're often shooting into the fire field from your Combustive Shot, or whatever other combo fields people lay down. (3) Signet of Rage is awesome and I'd never be without it, but otherwise signets stop scaling well around level 60. Consider going further into Arms, as 30 pts would get you the ability to build adrenaline from critical hits as well as adding precision and condition damage. With high crit chance this is a good way to build adrenaline throughout a fight. (4) You only have one stun break / condition removal. This might be okay for PvE but in PvP/WvW you'll need more. Warriors are a bit vulnerable to slows and conditions. I have both rifle and longbow, and sometimes I use both, but of the two I'd go with longbow every time. I just checked and I was wrong about Berserker's Power as it does apply to burst skills. I overlooked it as I didn't think it did, and may try that myself now! I'm pretty much settled on 0/30/0/10/30 though as I like the traits in Arms and Discipline (and wouldn't be without Stronger Bowstrings). So I found this thread on warrior builds: https://forum-en.guildwars2.com/foru... and tweaked it to suit my needs. I went for the full exotic berserker set of armor, and 7 superior soldier runes (the 7th for the underwater helm). Now I'm traited at 0/25/15/30/0 and it seems to be working well. Along with the healing signet, I get additional health regen from Adrenal Health AND from my banner. Plus if I'm under the effects of a food that grants a % chance to steal health on crit, there's that as well. Finally with the runes, my shouts remove conditions. This all has made me more survivable than I ever was when leveling up, and I'm doing more damage thanks to my armor stats. I went with Crack Shot, which makes the rifle pierce and its skills recharge faster. Now I'm hitting multiple mobs in fights and using the more devastating attacks more often with it. I ran through Orr with this, to get the level 80 underwater helm from the karma vendor in Cursed Shore and I was very happy with the results. Also pleased with it when I did the centaur world event. And I haven't even upgraded my accessories or added any sigils into my weapons. Also, with my previous build, I was holding on to my adrenaline for more damage and not using the burst skills. Now adrenaline doesn't affect damage and I can use the burst skills as I like-- which is a lot more fun. That looks really nice. The soldier runes add a bit of tough/vit along with the 15 in defence, so you should have a balance of power and survivability. Glad you're enjoying warrior, it's a fun class. What does the mace offhand add to the build over something like a shield or a warhorn? Just looking for more damage? Mace #4 is another source of vulnerability, combine it with axe #2 and it starts to stack up. But mostly I just like Tremor, the mace #5 skill. A 2 second knockdown for interrupts that goes out in a line in front of you. I just get a big grin whenever I can line it up to knockdown 3 or more foes at the same time. I'm only 47 in a 45 required dungeon (with level 80 gwjers) but being a pyro seems to really make a difference. The real boon is the maxed out adrenaline power for the bow. On tough targets it seems to double the slow rate of kill which becomes really noticable over time. And I found it ironic that the pugger who complained it was taking too long had made us all wait at one point while he went all the way back to the start of the map to get a POI he was missing. That was funny. Puggers be humorously ironic at times. I think Decartes said that. Heh, I remember that. I do have to say i was impressed at how smooth it went. If it did infact take a few more minutes, it was worth it for what seemed like the ease of which we regained control the few times chaos looked like it was going to overcome us. No deaths on my end was pretty significant considering as I said I was only 47 (46 at the time). The pugger died once but he was hard to keep track of and I just missed being able to help him. The AI tends to target people based on toughness and overall armour value and based on DPS (usually bosses). Because you were surrounded by L80 characters (mostly in exotic gear) the AI probably cut you a break. I saw that puggy's comment about how long it took. I think it wasnt a complaint specifically about this run, I just dont think he remembered/anticipated how long the caudecus explore paths can be. I thought I'd share a few things I've read that found useful for my warrior. Hopefully some of it may be useful for someone. The first is a build called "Sonic Boon" and it's essentially a party support build through shouts. They tried to design it around the support function without sacrificing damage output. I don't get too far into the theory crafting, but this is a fun build to try if you want to play more of a support role in a party while smacking things in the face. 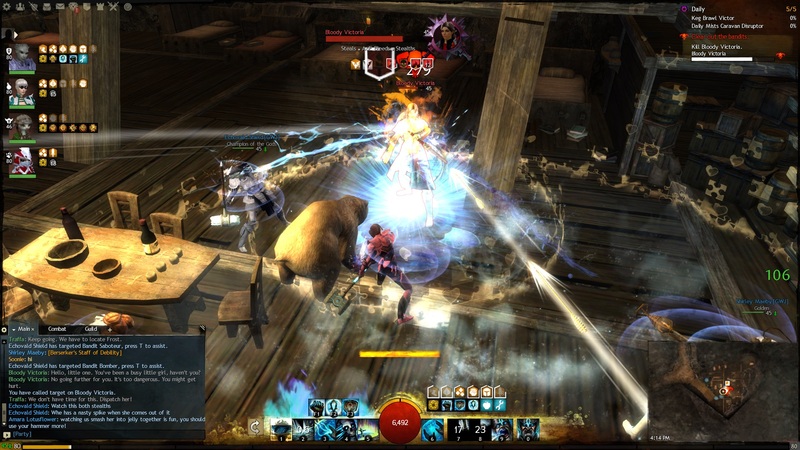 The second is a build called Strife's build from the Gw2 guru forums. This is the build I run currently and I've enjoyed it a lot. There's some math on those boards somewhere that shows this build to have the most potential damage across all warrior builds. One of the keys to it is the fact that it grabs the necessary traits out of Strength and Arms, then gets 10 into Tactics for the Empowered buff. Empowered is an INCREDIBLE T1 trait. When you roll in dungeons sometimes you'll find yourself with 5+ buffs (you can give three all by yourself when you trigger SoR). With Empowered that turns into a flat out damage increase of 2% per boon. Another post I've gotten good information out of is the Warrior Builds: Success and Failure. The guy comes of as kind of an elitist at times so take some of it with a grain of salt, but he's right about a lot of things. Don't be afraid to take a pure "glass cannon" build into difficult dungeons/fractals. Survivability has way more to do with understanding the fight mechanics, dodging, and luck than it does with your health pool or toughness. Save money on the stuff you put into your armor/weapons. Some of the runes/sigils have pretty cool features, but they're ridiculously expensive. If you're going for direct damage output, it's pretty hard to beat Ruby Orbs in your armor (20 Power/2% Crit Dam/14 Prec) and a Sigil of Force/Accuracy (5% damage/5% Crit Chance) on your weapon. By some accounts they're actually the best options for direct damage. They don't proc anything, and you might miss that "coolness" factor, but they're cheap and reliable. On a warrior - always try to bring a banner. Since they buffed them the last patch they make even more sense. A lot of folks kind of expect a banner and with good reason. The buff is really nice. I think the Banner of Discipline is the most useful, but if someone else already brought that either Banner of Strength or Banner of Tactics are decent too. Carry it with you as necessary and use the #2 and #3 skills. Rifle is the best single target ranged weapon we have. For anything other than single target, try the longbow. When you do a full adrenaline burst skill from the long bow it lays out a Fire Combo Field. Combo Fields are like pinata's full of awesome face wrecking goodness. You can blast your #3 longbow into the field and it equals Area Might for your party and massive damage to anything standing in it. your other team members can do all sorts of cool things with the Fields too. I get excited everytime I throw one of the fields out and all this cool stuff happens when people in the party finish the combo. Don't run a multiple signet build in a party run. You're sacrificing a ton of party utility for a limited benefit. Signet of Rage is fine, since it really is the best Elite we have (but Warbanner definitely has its uses). The only time it makes sense to run multiple signets is when you're running around solo killing stuff and exploring.